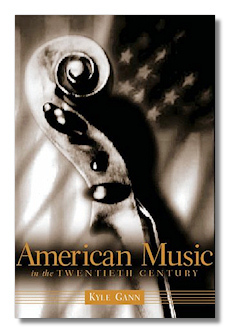 Like Struble's History Of American Classical Music, this is intended to be an historical survey, organized by period or style (with some of the same difficulties in keeping the apples and oranges separated) and by individual composer within those categories. Each survey focuses on musical composition and style, rather than performance practice, musical institutions, or economic and social aspects of the musical world, although such matters are touched on as part of the larger context of original creativity. Neither book is concerned directly with popular music or jazz, except as influences on what Struble does not mind calling "classical music," but which Gann refuses to refer to that way, because "classical" implies "European" to him. Both books deal largely with the present century, although Struble goes back much earlier and Gann lays heavy emphasis on recent music. At this point comparison between the two books comes to an end. About two thirds of Gann's book deal with the last quarter of the century. The periods Gann finds most appealing are the 1990's and 1920's, followed by the 1980's and 1930's. Gann, formerly a reviewer for Fanfare, is presently the new music critic for The Village Voice, and it shows. His preference for the "downtown" new music scene, rather than the "uptown" musical establishment is clear, both in the composers he includes and those he does not choose to discuss or even mention. As Struble noted, many composers today are heard only locally, and quite a number of the composers Gann discusses have been given a hearing mainly in New York. Solo "performance artists" and small ensembles loom large here. Although I have not been a stranger to new music concerts at various times and places, and although I would have said I was reasonably conversant with recent musical developments, a large percentage of the composers Gann chooses to discuss have names I am complately unfamiliar with – which was not the case with Struble's selection. To be sure, there are vastly more significant composers than can be included in any selection, but Gann's selections often seem driven more by personal preference rather than by prominence or influence. For instance, Gann discusses Mikel Rouse in depth, Christopher Rouse only in passing. He gives Walter Piston a bare mention at most, while writing – to my satisfaction, I admit – about Harold Shapero as "the composer who, more than any other, came to symbolize America's hard-core neoclassic movement with its devotion to Stravinsky." (105). I was less happy to see the finale of Shapero's "magnum opus," Symphony for Classical Orchestra, characterized as "Beethovenian bombast." Aside from that crack, Gann is generally respectful of all the composers he discusses. He does make his preferences for American rather than European, and experimental rather than traditional styles clear though, even to – surprisingly – quoting Roger Sessions (an example of what he sees as the European tradition) as saying "I have no sympathy with consciously sought originality." (107). Gann also describes the work of a remarkable number of women composers in some depth, and as a matter of course. Besides Ruth Crawford, among the 1920's "ultramodernists," he features Pauline Oliveros and Annea Lockwood, who burned one piano and drowned another, among the post-Cage conceptualists; and, as minimalist and performance artist, Meredith Monk; in connection with the new romanticism, Nancy Van de Vate (one of whose works shares a VMM disc with Rabushka's Clarinet Concerto); with reference to jazz and rock influences, Laurie Anderson; among post-minimalists, Janice Giteck, Elodie Lauten, and Mary Ellen Childs; and among the "totalists," Lois V. Vierk, Eve Beglarian, Bernadette Speach, and, briefly, Brenda Hutchinson, Laetitia de Compiegne Sonami, and Linda Fischer. Gann's survey begins with the "forefathers," Ives and Ruggles, and moves quickly to "ultramodernism" in the '20s: Cowell, Varèse, Crawford, Antheil and McPhee. (The kind of Asian influences the last-named represents feature prominently in later chapters.) "Populism in the 1930's" begins with Copland and Harris, before settling down to discuss American opera, with perhaps surprising sympathy for Thomson, Barber and Menotti, as well as Gershwin and Bernstein. Moving on to "experimentalism," Harry Partch, Ben Johnston, Conlon Nancarrow, Lou Harrison, Henry Brant and Alan Hovhaness share a chapter. "Atonality and European Influences" brings together diverse styles, sometimes in the same composers, and seemingly as briefly as possible. There is a remarkably long chapter on electronic music, and extended treatment of Cage and post-Cage conceptualism, minimalism and post-minimalism, which Gann is at pains to distinguish (he does not permit Glass and Reich to disavow the term), but he places John Adams among the new romantics. John Luther Adams finds himself among the "totalists." Few neoromantics are discussed – no more than Struble included, but the names that appear in connection with several of these other movements are far too numerous and, for me, too unfamiliar even to mention. Let me just say that someone looking for an introduction to new musical experiences might do well to dip into this book. Just a word about "totalism," which I have to admit was not part of my vocabulary before, and with which Gann ends his survey. I am still not entirely clear about it, because I know little of the music discussed here, but Gann describes it as "music that appeals to audiences on a sensuous and visceral level, and yet which still contains enough complexity and intricate musical devices to attract the more sophisticated aficianado. It also imples using all the musical resources available…" (355) These include jazz and Asian styles. A steady beat may coincide with polyrhythms, in contrast with music by Carter or Babbitt, whose rhythms are harder to follow. Gann writes well. He includes many musical examples and considerable musical analysis. There are many photographs of composers. A composer himself, Gann gives himself a short paragraph toward the end – in the third person.